The FX100 Audio Analyzer is a modular system equipped with up to four parallel analysis channels. Microphones or vibration sensors can be connected to each of these channels; the Flexus FX100 provides various phantom power options including an ICP supply. The FX-Control PC software allows the user to control the FX100 by visualizing the connected sensors and adjusting their properties, such as supply and sensitivity. With a simple ”drag and drop” the desired measurements are selected, grouped and displayed. Results from the microphone and vibration sensors are configurable in the desired units of ”dBSPL” and ”m/s2” respectively. Specific frequency values as well as narrow and broadband level values can be displayed. These measured level values can also be represented as a full FFT spectrum as well as an RTA time result. Using ”Pure Sound” technology, transients can be captured. Therefore even the smallest mechanical defects of the device under test, which manifest themselves in scratching, scraping or rattling, can be measured within the framework of such a quality test. Results can be further processed or combined using functions from the extensive math library of the FX-Control software. The measurements and calculations can also be compared against pass/fail criteria. This provides a comprehensive analysis of the device under test. Measurements and calculations from the FX-Control software can be stored in various data formats. If desired, an automatic measurement report is generated at the end of a measurement. The format of the report can be freely configured by the user. 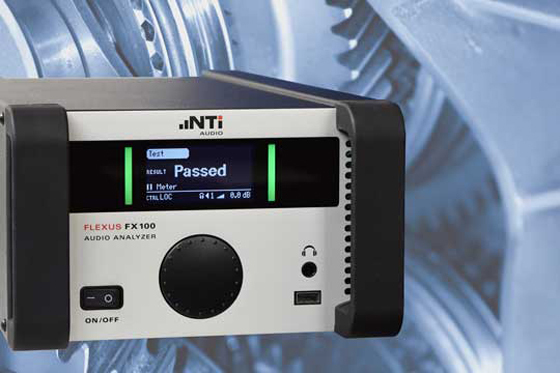 The FX100 Audio Analyzer with the FX-Control software is a modern, powerful and flexible measurement system that is ideally suited for air-borne and structure-borne noise measurements.